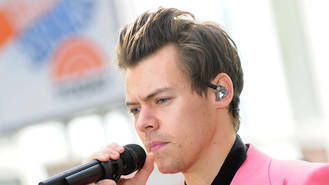 Harry Styles' stepfather Robin Twist has died after losing his battle with cancer. Robin, who married Harry's mother Anne Cox in 2013, was reportedly just 57 years old at the time of his tragic passing on 20 June (17). A representative for the One Direction singer told The Sun: "Harry’s stepfather, Robin Twist, sadly passed away this week after a long battle with cancer. "The family asks for privacy at this time." Fans of the singer rushed to offer their condolences to him, and Robin's family, following the announcement. Robin's ex-wife Erica Jane Morgan changed her Facebook profile picture to one of her and Robin in happier times, and was flooded with messages of support from friends. In response to several of the messages, Erica wrote: "Thank you", alongside a broken heart emoji. Meanwhile, Robin's daughter Amy Twist also has a profile on Facebook, for which the picture is a snap of her and her dad. And friends and fans all rushed to offer their condolences, with messages including: "My thoughts are with you." Another fan shared a picture of Harry and Robin on Facebook, which was reportedly taken in the final days of his life when the singer returned to his home town of Holmes Chapel in Cheshire, England. "That's why Harry was at Holmes Chapel, and he still agreed to take pictures with his fans and his puffy eyes say it all," the sharer captioned the pictures, in which Harry was seen hugging a smiling Robin before covering his face with a blanket. Harry has been close to Robin since he married his mother, acting as best man and even walking Anne down the aisle at the nuptials in 2013. He described the speech he made at the nuptials as "the most nerve-wracking thing” he'd ever done. Robin had long been a supporter of the One Direction boys, frequently posting about their successes as a band and solo artists. He and Anne recently accompanied Harry to America when the singer filmed his week-long residency on The Late Late Show with James Corden. Robin also shared a selfie alongside James and Anne, which he later changed to his profile picture on Twitter. The tragic news of Robin's passing comes just six months after Harry's 1D bandmate Louis Tomlinson lost his mother Johannah Deakin to leukaemia. Loretta Lynn has cancelled two concerts next month (Jul17) due to unforeseen circumstances. Hip-hop mogul JAY-Z has acknowledged the power of community in an uplifting column about his fight for social justice. DJ Khaled no longer blames Electric Daisy Carnival (EDC) organisers for the sound failures that marred his set at the festival. Ed Sheeran had difficulties keeping his mouth shut after learning he was going to receive an MBE. Metallica's James Hetfield has conceded that the band could "fall apart" at any moment. Nick Carter would support his son if he wanted to follow in his footsteps by joining a boy band. Rapper T.I. is heading back to TV as the star of a new police drama. Alex Rodriguez has praised his girlfriend Jennifer Lopez for being a "role model" to his daughters. John Legend has been forced to postpone shows to give his voice time to recover after falling ill.